Think you know world geography? 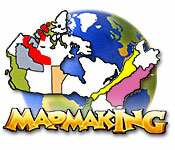 See if you can place states, provinces, and countries correctly in this online mapmaking game.Map out your geography skills!Put your geography skills to the test with Mapmaking. Place states and provinces into countries and countries into continents as you play this online game designed to boost your knowledge of the globe. Select a map, and then drag the states or countries into the correct position. If you miss, the map will provide a helpful hint. So, where in the world are Parayan and Jumla? Choose one of the 17 maps in Mapmaking and find out!